Another e-mail from EPIK today stating that there is a potential date for orientation : ) Now it is not just hear say from Dave ESL cafe for me, but from someone who knows more about my job. So…I know that EPIK training lasts for more than 1 day so having this tentative schedule makes me feel better about having a job- also it confuses me! So I arrive on the 18th good to know, JeonJu University is not close to Busan at all so that is funny. 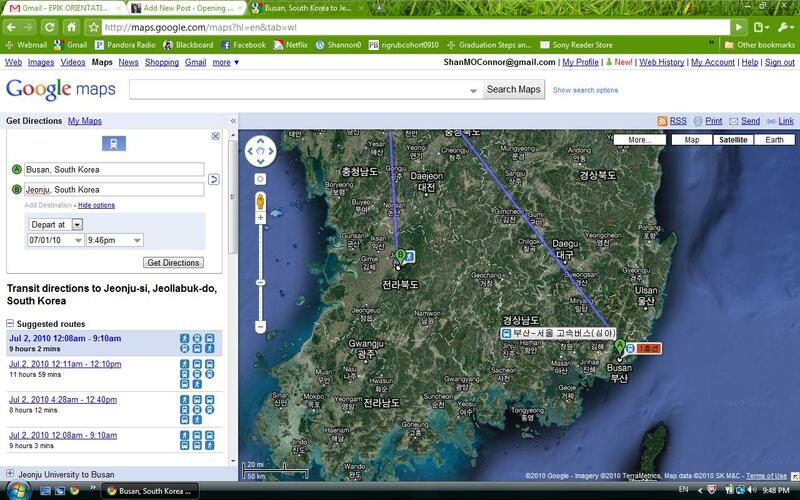 The route I would take from the orientation in JeonJu to Busan, where I would be teaching. I am however very happy to know that I am considered to be on their mailing list as having a job! 🙂 Jeff and I are near each other on the mailing list and maybe that is a sign that we will be near each other in Busan…the 2nd largest city in South Korea, oye vey. I feel like we will be alright, we both have so much that we want to accomplish while in Korea and it will be a great experience for both of us together and apart. More to come once we find out more… Joyce did ask us for our addresses so EPIK is sending us our contracts soon. Well the e-mail says by mid July- oh my! So much for getting our documents in early to get the process rolling…!!! I am hoping that our timely manner will place us near each other in Busan. It is all coming together! Ahh I have started to pack away things and give things away. You didn’t apply for housing together? Most couples in Korea live together in a shared apartment. EPIK does keep you guessing until you reach destination. I hope location works out for both of you. Thanks for responding! I started reading your blog about a month ago, you always have great pictures to add to your stories. Jeff and I were told that we could not apply for housing because we are not married. : / That is okay with us, we just hope we are near each other. We have been long distance this past year and want to be together! We just found out yesterday that we aren’t in Busan : ( EPIK changed things on us and we are Daegu- which doesn’t look like its too far from Busan. Are you staying another year? It would be so fun to meet the “Only in Korea” girl haha.